Regarding the unsaved, they should “seek the pardoning grace of an ever-loving Father,” while Christians should “redouble their efforts for the salvation of the lost.” Heaven is “everlasting joy and glory” prepared “for the saints of God (Matt. 25:34).” Read more on Amish beliefs on Heaven and Hell in 1001 Questions and Answers on the Christian Life. How do Amish mourn their dead? While Amish focus on the world beyond this one, they certainly feel sorrow and loss like any other humans when loved ones pass away. Amish women typically wear black dresses as a signifier of loss. The length of time a women may wear such a dress depends on the relationship to the deceased, with the black garment being worn for a longer time period the closer the connection. Amish people may visit a cemetery in remembrance of a lost loved one, but they do not pray for the souls of the deceased as in other Christian denominations, given the belief that all that can influence their final state has already transpired. Amish cemetery. Nappanee, Indiana settlement. An Amish funeral service is similar to a church service, held in the home and with preaching by two ministers. The body of the deceased is placed in a pine casket, usually made by an Amish person. Amish funerals are often very well-attended, as are viewings, which are also held at Amish homes. Read more on Amish funerals. Yes, deceased Amish people are typically embalmed by a professional mortician before the body is returned home for the viewing. The most conservative Amish may abstain from this practice. Amish may make limited use of funeral home services, particularly for embalming the body, but viewings and funeral services are typically held in the home, as is the typical Amish practice regarding church services. 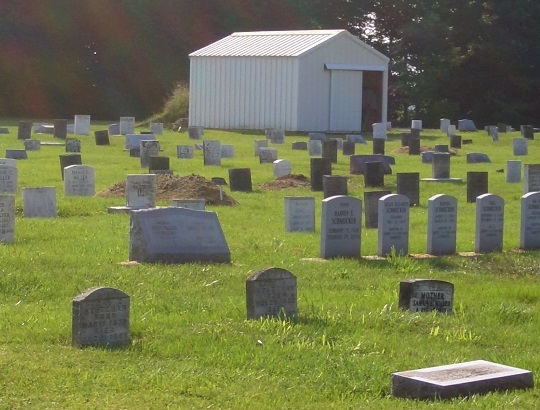 Amish cemeteries are located in various places throughout the community, often on a patch of farmland. They are recognizable by their simple gravestones and fencing. In some places (Lancaster County) Amish may be buried alongside Mennonites but in most cases Amish have their own private cemeteries. Members of the community take turns tending and maintaining the cemetery grounds. 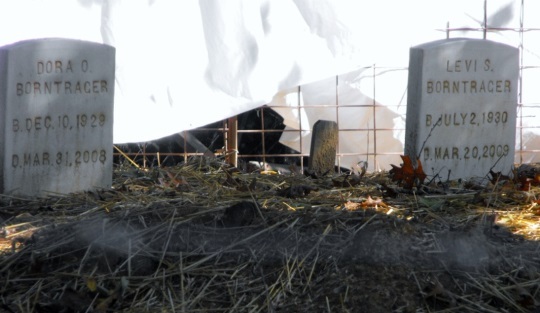 Amish are typically buried in very simple pine caskets. These may be made by a member of the community who builds caskets as a business. Brown, Joshua R. “An Amish Mortuary Ritual at the Intersection of Cultural Anthropology and Lexicography.” Yearbook for German-American Studies Supplemental Issue Volume 3 (2010): 85-100. To Cite this Page: Wesner, Erik J. “Death.” Amish America. Erik Wesner, 11 Feb. 2015. Web. [Date Accessed]. <http://amishamerica.com/death/>. I appreciate the information you shared here, Erik. My father’s family (United Brethren) always had the viewing in their home until the last thirty years or so, with someone sitting with the body at all times–usually for 2-3 days. I remember it being a very sweet time for the family–very personal and healing. Enjoyed learning more about the Amish It came as no surprise to me that their way of life is very close to God’s law.